AUSTIN (Jan. 31, 2019) – The Austin Spurs, presented by SWBC, will celebrate the start of Black History Month on Friday, Feb. 8 when they host the Oklahoma City Blue in the annual Black History Game. Tipoff is set for 7:30 p.m. at the H-E-B Center at Cedar Park. Fans are encouraged to get to the game early, as the first 500 people to enter the arena will be given a free Black History Month t-shirt, courtesy of McDonald’s of Cedar Park and Leander. The Austin Spurs will honor the McDonald’s locations’ franchise owner, Marty Washington, during the game in celebration of the 2019 Black History Month theme, Black Migrations. Washington moved to the Austin, Texas area from the Midwest almost 20 years ago. Prior to the game, the Spurs will host a community conversation between youth, law enforcement and community leaders to discuss relevant local issues and to have an open dialogue about the challenges the community faces and our shared responsibility to create change. Local collegiate step teams will be providing entertainment throughout the night and black organizations from the Austin area are invited to attend the game free of charge. Throughout February, the NBA, the NBA G League and the WNBA celebrate black history and culture, support the national dialogue on race and equality, and bring teams, players and fans together to take collective action in their communities. 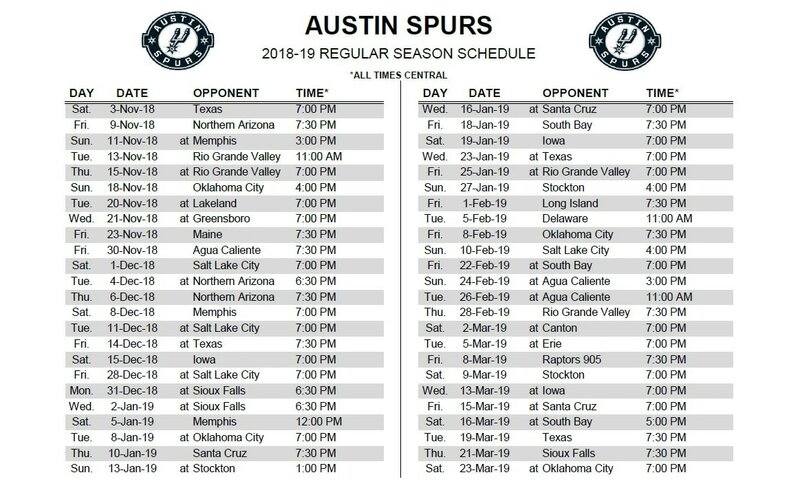 To purchase tickets or find more information regarding the Black History Game, call the Austin Spurs office at (512) 236-8333 or go to austinspurs.com.